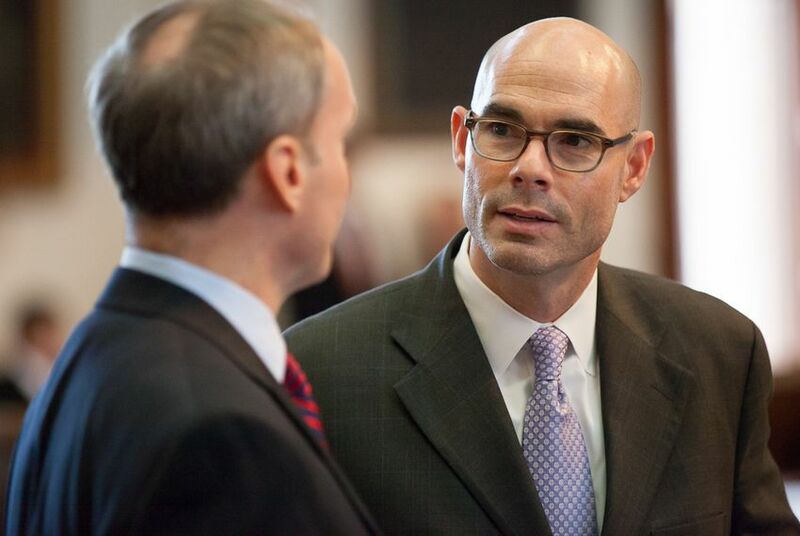 House Ways and Means Chairman Dennis Bonnen filed the Texas House's property tax reform bill, a measure he said will help Texans keep local governments accountable in setting property tax rates. Editor's note: This story has been updated with a comment from state Sen. Paul Bettencourt. Saying there needs to be more transparency in how property taxes are assessed in Texas, the head of the House Ways and Means Committee unveiled legislation Friday that would reduce the maximum increase allowed in taxes on individual properties. House Bill 15, dubbed the “Property Taxpayer Empowerment Act” and authored by state Rep. Dennis Bonnen, R-Angleton, would reduce the maximum increase in taxes for a property — from 8 percent to 4 percent. The legislation would also require local governments to annually publish a “No New Taxes Rate" — which is the rate that would raise the same amount of money as the previous year — and restrict debt service taxes to debt that has been approved by voters. While rates are often kept the same, climbing property values in Texas are rising, leading to higher tax bills for Texas property owners. According to a Lincoln Institute of Land Policy study, the average per-capita property tax burden in the United States was $1,441, compared with $1,563 in Texas. Under Texas law, state lawmakers don’t have the power to raise or lower property tax rates. Only local governments — like school districts, cities, counties and hospital districts — are allowed to tax property in Texas. The issue of property tax relief has been a common talking point among members of the House and Senate. Lt. Gov. Dan Patrick has said that property tax relief must be a priority, and Sen. Paul Bettencourt has filed Senate Bill 2, which also addresses property tax reform. Bettencourt complimented Bonnen's bill on Friday. "I'm really looking forward to seeing the debate progress in both the House and Senate because I think the proposals have a lot of commonality," Bettencourt said. "But more importantly, I think, [is] the recognition of just how important getting homeowners and business owners property tax relief is this legislative session." The offices of Patrick and Senate Finance Committee Chairwoman Jane Nelson didn't immediately respond to a request for comment for this article. Last session, the Texas House voted 141-0 for House Bill 31, another piece of legislation authored by Bonnen. The bill contained a $4.9 billion tax relief plan that would have cut the state sales tax rate from 6.25 percent to 5.95 percent. The House also backed legislation making cuts to the state’s franchise tax. The House legislation marked a clear line in the sand against the Texas Senate’s strategy, which favored property tax cuts in addition to franchise tax cuts. Bonnen had repeatedly dismissed the Senate’s proposal as an inevitable letdown for Texans, predicting most won’t see their property tax bills decrease because of increases in property appraisals and local tax rates. In a compromise, the chambers signed off Senate Bill 1, which backed increasing the homestead exemption from $15,000 to $25,000 and also included property tax relief and cuts to the franchise tax. While he had yet to do a full review of HB 15, Manny Garcia, deputy executive director of Texas Democrats, told the Texas Tribune Friday that local counties are being put in a position where they have to raise their property taxes because Republican lawmakers have "choked education and health care and they've threatened massive cuts" this legislative session. "As a general principle, we agree that when you are choking education and health care and forcing local counties and school boards to make up the difference ... then you are in fact raising property taxes," Garcia said. "That is our general position on state budgets." Creating a searchable statewide database that allows property owners to see how each jurisdiction’s proposed tax rates will directly affect their individual tax bill, along with detailed information about how they can make their voices heard in the local rate-setting process. Removing the “Estimate of Tax Due” on appraisal notices. Making a property tax rollback election automatic after a government taxing unit proposes a rate that exceeds the rollback rate, no longer requiring citizens to gather signatures to petition for a rollback election. In Friday’s news release, Bonnen maintained his new bill will encourage people against rising property tax rates to fight back at the local level.